← Genealogy + online skills + teamwork = ??? 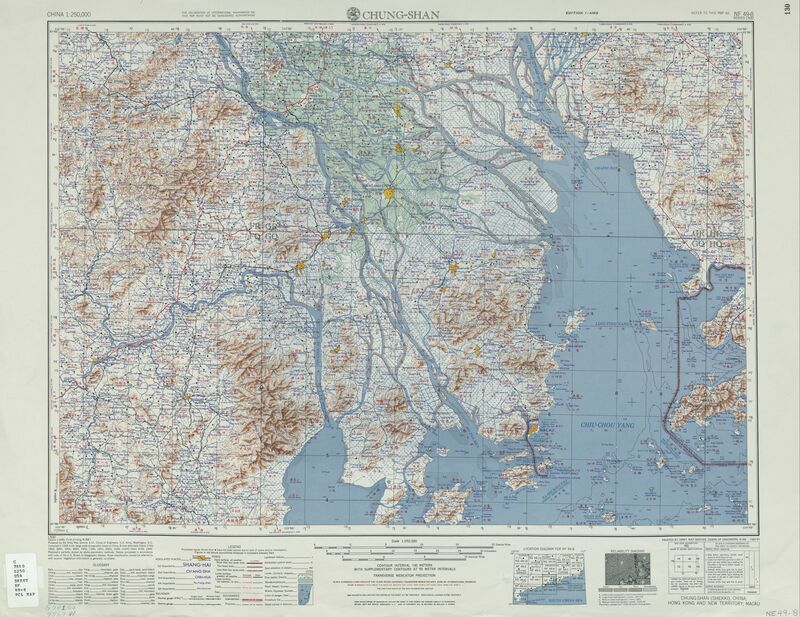 Thanks to the smarties at Harvard and the University of Texas, we can view some pretty decent digital versions of some old US military maps of China. These are collections of maps produced during the 50’s and going forward. They are useful for getting snapshot of names and places over half a century ago, when a lot more immigration to the US started happening thanks to the lift of the 1882 Chinese Exclusion Act. Basically, a snapshot of how your parents’ or grandparents’ China was laid out. You may or may not be able to find place names that have since changed or are no longer in existence, but may still be remembered by your immigrant ancestors. Here, on the “Chungshan” map, you will find Hoisan down in the southwest corner. Secondly, one of my favorite Hoisanese resources I’ve ever come across is another product of the US military, the Department of Defense’s Defense Language Institute’s textbook for it’s old “Toishan dialect” basic course. It is a lengthy and practical guide to spoken thlay-yeep 四邑 dialect, which is generally what we call the group of the dialects of Hoisan, Hoipen, Yinpen, Thleenwoi, and Hoksan counties/cities. This guide is the only instruction manual or textbook I have ever come across that teaches non-Chinese speakers how to speak Hoisanwah. There are thousands of classes and books that will teach you Mandarin and standard Cantonese, but so far only this one that will give you some good ole’ thlay-yeep country chops. A lot of people from the non-thlay-yeep spoken world regard Hoisanwah and related dialects as barbaric, too loud, unrefined and indicative of uneducated “hick” type of people. To those people, I say, well I’m not gonna say it because it’s way too vulgar in Hoisanwah, but to put it lightly, Hoisanwah is a rich and emotional, dare I say beautiful language (yes I really do consider it a language) that has deep roots in Middle Chinese and must be learned and spoken to be appreciated. It has more tones than many other Chinese dialects, and the vocabulary is amazing; one single syllable in Hoisanwah can have so much meaning — for those of you who are familiar, just think of the word 胺 “ngaht” and you can smell it! And if you get a verbal lashing in Hoisanwah, you have really felt the effects of a force that comes from somewhere deep within. Download the full guide HERE. Posted in Chinese, History, Military, Web resources. Bookmark the permalink.